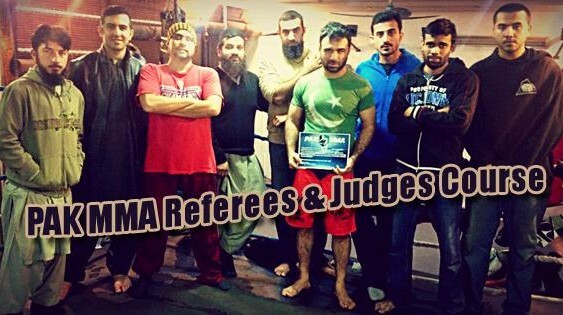 PAK MMA conducted one-hour “Referee and Judges Course” at Lahore. On January 23, 2015 the course was conducted at Synergy MMA Academy at 8 pm and the same course was conducted at VCLF4F the next day at the same time so no one could miss the course. Course material was provided by ONEFC official – Mr. Terry Boehlke. The event was managed by Fights Promoter-Sheikh Sultan Shahid of VCL and MMA Promoter- Zubair Asghar, founder of Coretex. 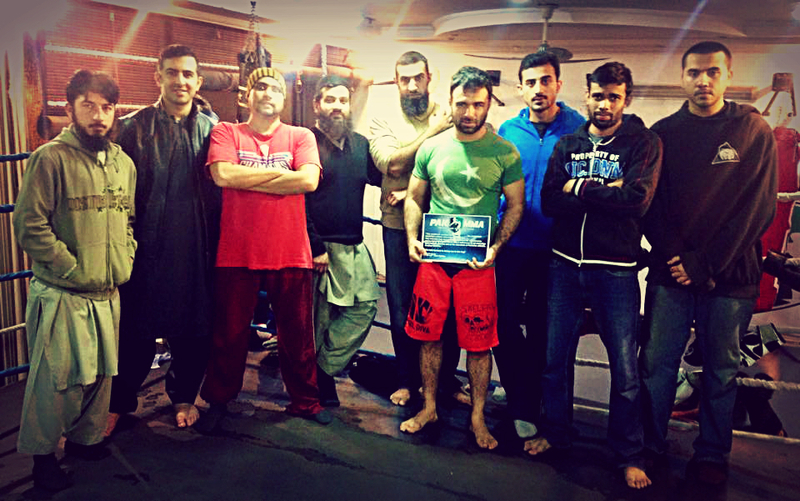 It was taught by Bashir Ahmad – President of Mixed Martial Arts Pakistan. Safety and Integrity: Safety and Integrity needs to be the focus of your officiating team. Without safety and integrity you have nothing. Without safety you will have serious injuries and even death. You will lose fighters and be shut down. Without integrity the quality of the event is questionable. You will not be able to trust the results or how they are earned. Ethics, perception, and professionalism: It is not only important to set and maintain a high level of professionalism but to guard against perceptions of impropriety. The more professional you appear the easier it will be for people to accept your authority and position. If you look like another fighter or fan eventually you will be treated like one. Having a uniform helps all black is an industry standard. Avoid situations that may result in the appearance of bias. You are there to be an official not a fan. Do not engage the press or comments on the internet. Do not discuss stoppages or judgments with anyone but your head official. Allow the head official to handle any controversy. Be polite, respectful and professional at all times. During the event you should be attentive, alert, stoic and focused. Know the rules and enforce them unwaveringly, equally, and without emotion. Consistency is the key to smooth enforcement. Inconsistency leads to confusion, frustration, and a lack of credibility. The fighters and the fans should not have to guess which rules are going to be adhered to and which ones are not. Distance with fighters: Distance from competitors near enough to stop the action when needed far enough to not interfere with the competitors. Keep a triangle with the fighters. Avoid being behind either fighter. You should be able to see both fighters at the same time. 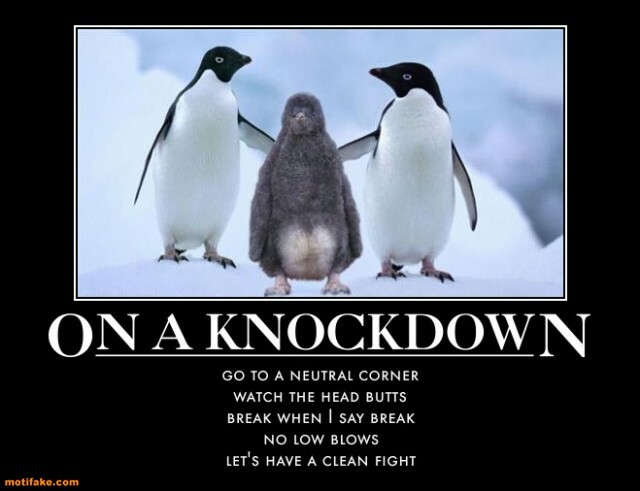 If you have a left handed fighter vs a right handed fighter try to stay on the open side. Be in the best position to see the action even if that means lying down. 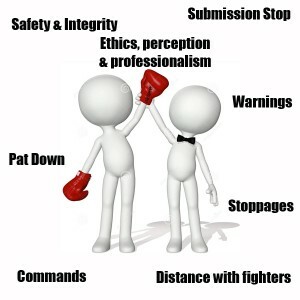 If a fighter is dazed or near submission ensure you are near enough to stop the action. Understand the condition of the fighters as they become fatigued or frustrated fouls are more likely to occur. When the ten second warning sounds, start counting down and move closer so that you can stop the action at the bell. Pat Down: Use the same order every time you perform the inspection. Check for anything slippery applied to the fighter. Ensure finger and toe nails are trimmed. Ensure no jewelry is present including tongue piercings. No tape or wraps are present other than the hand wraps. Verify mouth guard, and cup. Verify Shorts have no pockets or strings. Ensure the wraps and glove have not been tampered with or soaked. Ensure no other equipment or clothing go into the cage with the fighter. Witness the application of Vaseline. Ensure that Vaseline is only applied around the eyes and is only a thin layer. The order I use is, stop the fighter. Then instruct the fighter to remove all non-fight gear. Allow final contact with the team. Bring the fighter to the inspection point; at this point there will be no further contact with the corners. Without gloves check head, ears, neck, and arms for slippery substances. Inspect gloves, wraps, and fingernails. Check torso front and back and legs for grease. Check toe nails and shorts. Witness Vaseline and direct the fighter to the cage ensure that the fighter does not relocate the Vaseline. 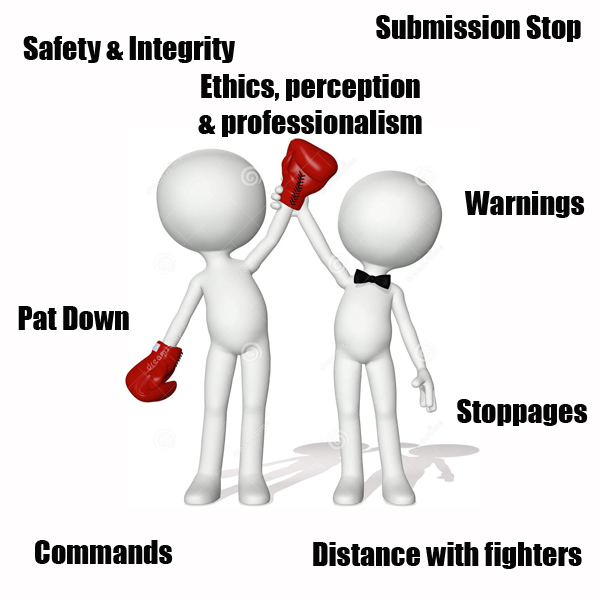 Stoppages: When a fighter is not intelligently defending himself. When a fighter taps physically or verbally by crying out. Doctor requested stoppage due to injury (usually but not limited cuts). The doctor should be called to the cage by the referee. When there is an obvious injury (like a broken leg) or knock out. Separate the fighters then Signal the stoppage by waving your arms over your head. Then call the ring doctors in as required. Submission Stop: be in position to stop when there is a catch (near submission). Signal the catch. A thumbs up with the pointer finger extended pointing at the catch. At the tap stop the fighters and signal the stoppage by waving your hands overhead. Bring in the ring doctor as required. The referee is responsible to inspect the ring ensuring that it causes no injuries and does not become a factor in the competition. Referees need to put themselves in the best position to view the action without regard to cameras. Hand – at an appropriate time signal time (big hand gesture over the shoulder so all can see). Move the fighter to neutral corners. Making a big grabbing hand gesture caution the fighter not to grab the fence and resume the round. If you use this escalation it will be well communicated to all what is happening and why. Depending on the foul and how the foul occurs and you can omit some of the steps or go directly to a disqualification. Intentional or unintentional – Mostly a judgment call. Low blows happen applying grease to your fighter is intentional. Between rounds if you question the ability of the fighter to continue it would be wise to use the ring doctors. If the fighter has no obvious injuries, the posture, composure, and desire to continue, I have not seen a fight stopped between rounds. Post by Synergy MMA Academy. We would like to thank Mr. Terry Boehlke for providing us with the course material and making the event possible.